“They are intent on making every conversation and every form of behavior in the world known to them." This statement should scare you. It should scare you to a profound degree and make you clutch onto your civil liberties (not that we have many left) like you’re fleeing a house that’s just caught fire. Unless you’ve been living under a rock, you’d know the above statement comes from Edward Snowden, a 29-year-old (former) infrastructure analyst and systems engineer for the CIA and NSA that has just pulled a big fat 'David’ against the behemoth Goliath, aka the National Security Agency. It is the story on every one’s lips and front of every newspaper from here to China; and for the simple fact that one man, one solitary man has had the cojones to out one of the biggest security agencies for a surveillance system that in his words, is designed to destroy our democratic rights. In the last few months, Snowden has not only left his job, his home and his girlfriend, but then decided to out himself as the whistleblower who turned over a handful of documents to a British newspaper pertaining to the NSA’s surveillance program known as Prism. This, in my opinion and that of many others, is a profoundly courageous and bold move to put himself out there, and very rare as most whistleblowers seek to remain anonymous. Cause well, his life is going to get pretty bumpy from here on out. At the moment he is holed up in a hotel in Hong Kong waiting out the storm, or making sure the next Jason Bourne doesn’t take him out. For those calling for his head (literally), citing what he’s done as an act of treason, he states that to the contrary, he is not subverting the government as he is openly (and not hiding behind anything or anyone) stating the facts and on the contrary, he is fighting for the citizens of a country he so believes in. And furthermore, he is not a spy, or a traitor; he is just a guy that sat in an office and watched a government that he believed in trounce all over our civil liberties in an egregious way and leave him jaded and disheartened, not to mention feeling utterly remorseful for having a hand in it. More importantly, he believes it’s the public’s right to decide if the government should be watching and gathering information from its citizens to such a degree as this. [Up to us, haaaaa. As if]. Others (civil liberties groups, politicians, citizens around the world) of course are calling him a hero for finally uncovering the furtive actions of the government that are eradicating the publics right to privacy. Although he says he doesn’t want to be a hero, he didn’t do it for money and he could’ve turned over many documents to foreign governments but chose not to as he says, he was after transparency not harming people. He knows he is now in peril and what he has given up but he said that things were getting worse by the day and he could no longer sit by and watch it happen. So where does it stop? And more importantly, why should we care that our emails and phone calls are being watched and recorded and more importantly stored. For some of you, you won’t care. You’ll figure, I have nothing to hide; they can read what they want. For others, it’ll dawn on you that a government having that amount of information on its people is a dangerous thing. And let me just draw a very clear picture of what the NSA is doing according to Snowden. They are allowing themselves the capability (and increasing in pervasiveness with every passing day) to follow your every word and action via your email, internet and phone devices (and taking it one step further by storing it). So that means, every fight with your husband via email (and text I’m sure) about the kids or the fact that he drove home having one too many beers, every email to the accountant asking to help you find a tax loophole, every concerned email about little Jimmy’s aggressive behavior, every sexual confession you made to a girlfriend, every transgression, sin, and worry. It’s not only notated and categorized, and flagged, but also stored for future use if needed. I’ll give you a minute to really take that statement in, cause it’s a doozy. As I said, for some of you, this information will pass right over your head and you’ll dismiss it as paranoid or par for the course in today's times; you’ll post another photo on FB and send another email to your sister in Duluth. For me personally, I plan to make changes, radical changes. Not because I have things to hide, but because I’d like to think I can operate in a world with an expectation of privacy from my own government (oh silly silly naïve me). I’d like a line to be drawn in the sand that says, you (government) may protect me in certain ways I approve and vote on as a citizen of the United States, but when you keep pushing that line to infringe upon my rights and do this in such a furtive manner, I’d like to give you the big middle finger. 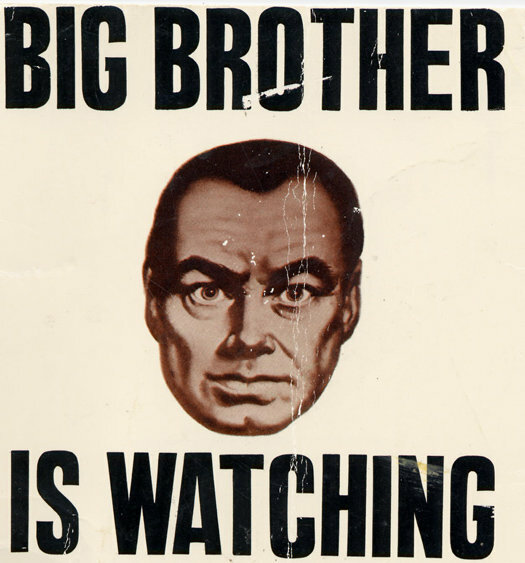 Now that big brother is reading my emails and recording my calls, at what point will BB be invading my home without a warrant (oh wait they can already do that). At what point will BB be imprisoning me without cause (wait, they can do that too). At what point will I be utterly transparent to those in power (those untrustworthy humans) to do what they see fit with the information gathered. So from where I sit (quickly figuring out how to close down my emails and switch to a private server), I’m alarmed. I’m very alarmed. And yet, not the least bit surprised.